Elis Caffe Bar – Where coffee rules! When it comes to a great coffee, Elis caffe is a place not to be missed. As the first specialized coffee bar in Zagreb, where people usually come for a cup of conversation and a cup of excellent coffee, Elis is quite small in size but big in taste when we talk about coffee beans. This widely known spot draws curious travelers from the entire globe to taste great coffee and in case you did not have the privilege to visit it so far, I strongly suggest going there for a wellness for your palate. Elis caffé is not just a coffee bar, it is also a coffee roastery. The smell inside is absolutely fantastic and with the possibility to buy the Elis caffe coffee brand it is a haven for true coffee “addicts”. Elis offers the classical range of coffee drinks but the biggest mistake you can make is to come to this coffee oasis and order a Nescafé :-). 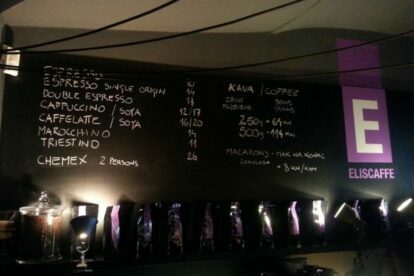 In case you cannot make up your mind, Nik, the owner and the triple Croatian Barista Champion, will advise you on what to choose. An interesting fact about this place is that smoking is not allowed. Actually, Elis caffe was the first non-smoking coffee bar in Croatia!